The craft made its second of 22 such dives at 3:38 p.m. EDT (1938 GMT) through the previously-unexplored 1,200-mile-wide (2,000 kilometers) region. As Cassini made its first crossing last week, it turned to keep its large antenna in front of itself as a shield. But ultimately, that proved unnecessary: The spacecraft encountered very few particles, and none were larger than those found in smoke (about 1 micron across), NASA officials said in a statement. To process the data from crossing the gap — which was gathered with Cassini’s Radio and Plasma Wave Science instrument poking out from behind the antenna acting as a shield — the researchers converted it to audio format. As a result, pops and cracks marked dust particles hitting the instrument’s antennas, NASA officials said, overlaid on the whistles and squeaks it normally detects. When Cassini passed just outside Saturn’s rings earlier in its mission, it detected hundreds of particle hits per second. But on this crossing, between the rings and the planet, it only detected a few. 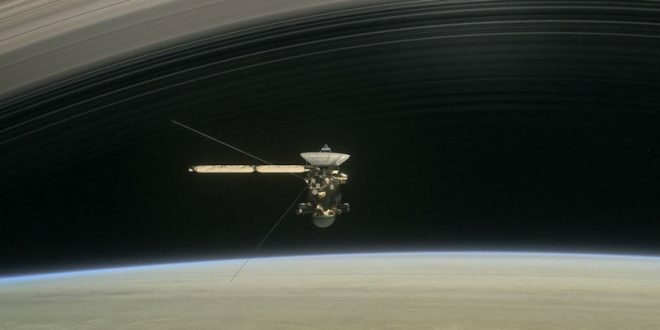 During its second orbit and dive, Cassini rolled quickly in place to calibrate its magnetometer, and surveyed and monitored the fine structures in Saturn’s rings. And it took advantage of the spacecraft’s angle and investigated the composition of Saturn’s moon Rhea, according to the mission page. While crossing, it came within 1,820 miles (2,930 km) of Saturn’s cloud tops, where the pressure is the same as Earth’s at sea level; and it came within 2,980 miles (4,780 km) of Saturn’s D ring’s inner edge.